RGN GPN with a particular interest in Diabetes and Asthma management. And have the authority to refer to other health care professionals if necessary. The practice nurse is available to deal with minor illnesses in the same way as a doctor and can see patients for the following chronic disease monitoring clinics. 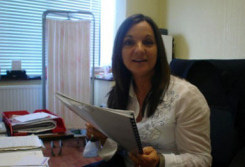 The practice manager is responsible for the day to day general management and smooth running of the practice. If you have any queries or suggestions about the practice administration, or if you should have any cause to complain about the service provided, Anita will be happy to speak to you. Reception staff will be able to help with queries or problems. Please do ask if you are unsure of anything. Reception can be very busy, especially in the mornings. If this proves to be the case, you will be dealt with as soon as possible. We do greatly appreciate the courtesy shown by our patients. If you feel your problem really cannot wait, please tell the receptionist. If you wish to speak to a receptionist in private, we have a confidential interview room for this purpose.